Jason tore the anterior cruciate ligament (ACL) of his knee on the job and required surgery to repair it. To recover completely and get back to work as quickly as possible, he joined the Early Return to Work (ERTW) program at Ability Rehabilitation. What Is the Early Return to Work (ERTW) Program? The Early Return To Work (ERTW) program provides workers’ compensation and disability rehabilitation custom designed for the “industrial athlete” to help them get back to work as quickly and safely as possible. The purpose of this work-related functional conditioning program is to prepare patients better to return to work without the risk of re-injury. This 4 to 6-week structured program utilizes standardized material and non-material objective testing to assess a patient’s current physical demand category (PDC) and compare that to the required PDC to return to work. 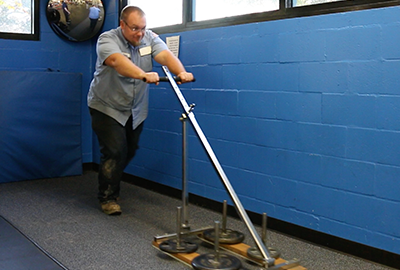 Once deficits are identified, an individual program is developed utilizing functional strength training and custom-designed work simulation equipment to simulate a patient’s individual job tasks as accurately as possible. Following ACL repair surgery, most patients experience pain and inflammation around the knee. Successful rehabilitation begins right after surgery to allow patients to alleviate swelling and discomfort, prevent stiffness, and preserve range of motion. Once the pain and swelling have diminished (usually after the first week following surgery), patients can then focus on the next phase of the ACL rehab process: restoring full extension of the knee. A physical therapist will provide patients with specific, gentle, early range of motion exercises to emphasize proper knee extension, and then gradually shift to exercises that focus on restoring full flexion and freeing up the muscles and tissues around the kneecap. For Jason, his road to full recovery was far from a walk in the park. The exercises he needed to do were intense and extremely challenging. But with the support of the Ability Rehabilitation staff, he was able to persevere and come out successful. Keeping the knee joint as mobile as possible in the early stages following surgery is critical for achieving a full recovery. Loss of mobility in the knee is a common problem after ACL surgery. Patients who are not diligent about exercising to restore their knee to full extension risk the buildup of scar tissue which can lead to arthrofibrosis and even arthritis. A person’s age, medical history, and lifestyle will all play a part in how long it takes to recover from ACL surgery fully. However, most patients will begin walking without support around one month after surgery. ACL surgery recovery is a slow and steady process that can last anywhere from six months to a year. A successful ACL rehabilitation program stems from the determination and will of the patient, and the experience and proper support of their physical therapy team. 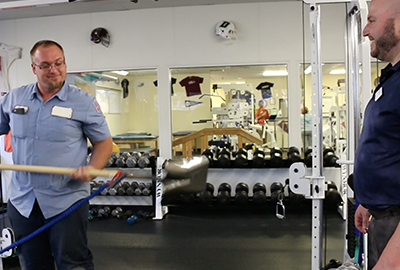 Jason appreciated the quality of care and support he received from the entire Ability Rehabilitation staff. “(They value) personal relationships, it wasn’t just about work,” Jason says.